What a difference a year makes! The largest drop in 2017 was less than 3%, while 2018 experienced the largest drop since 2009 at nearly 20%. In 2017, December saw near record highs while December of 2018 was the worst on record (except 1931, The Great Depression); Christmas Eve was the worst in history. 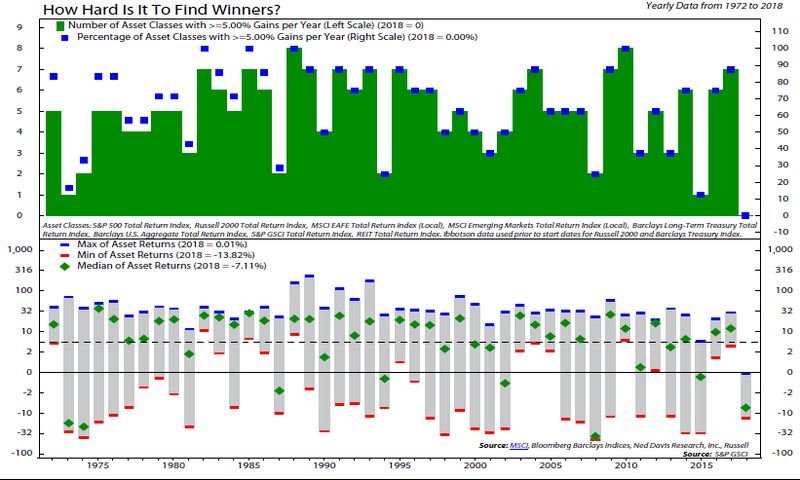 Stocks were not the only problem investment: nearly every major asset class was negative for the year with the exception of the aggregate bond index which was up 0.01%. The chart below shows that among the eight largest asset classes, none gained more than 5% for the first time since 1972 (see chart below). 2018 was a major anomaly and will go down in history as a tough year for investors. This blog is for informational purposes only. The statements contained herein are solely based upon the opinions of Canal Capital Management, LLC and the data available at the time of publication of this report, and there is no assurance that any predicted results will actually occur. Information was obtained from third party sources which we believe to be reliable but are not guaranteed as to their accuracy or completeness. This blog contains no recommendations to buy or sell any specific securities and should not be considered investment advice of any kind. Past performance is no guarantee of future results. In making an investment decision individuals should utilize other information sources and the advice of their investment advisor. ©2019 Canal Capital Management. All rights reserved.